Flat track is where it’s at. It’s a shot of adrenaline for both fans and racers, and the ‘go fast, turn left’ bikes look terrific. It’s also one of the few codes where Harley is still competitive. The XR-750 ruled the roost in the 70s, and today it’s the weapon of choice for stars like Brad ‘The Bullet’ Baker. 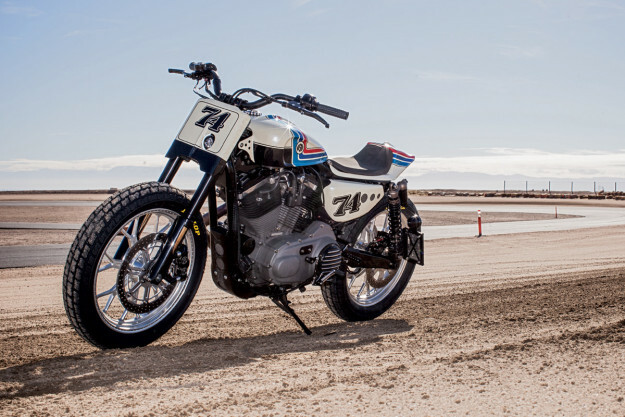 The thought of turning an XR-750 flat tracker into a street machine is tempting. And the stripped-down style is becoming real popular with custom builders. But a genuine XR-750 will set you back between $20,000 and $60,000, and in most States you can’t make the bike road-legal. Unless you weld in part of a Sportster frame—the bit with the VIN plate attached. 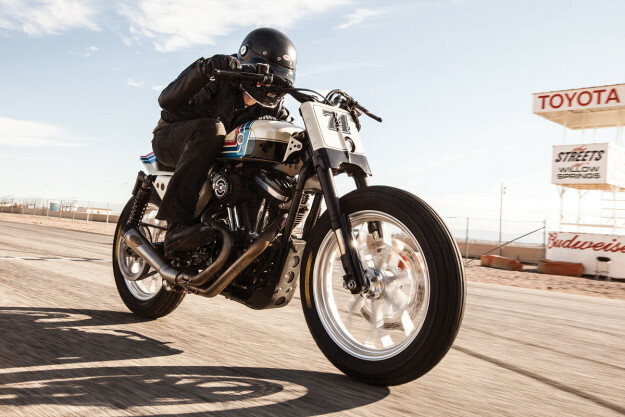 The solution is to inject a modern Sportster with dash of flat track style. You’ll get a bike that idles properly and doesn’t need a push-start. 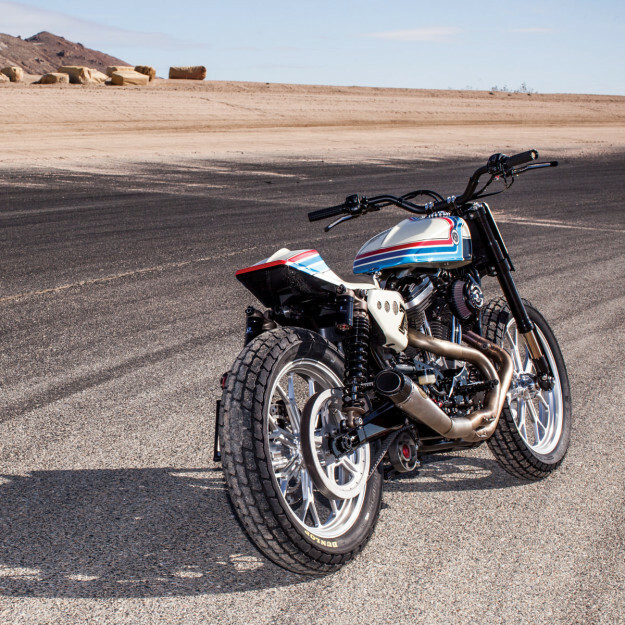 So Roland Sands has done exactly that with his new Ameri-Tracker build. 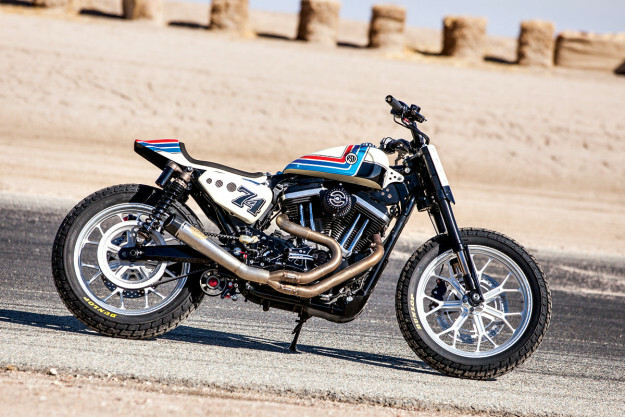 It’s based on a 2008-spec Nightster—with a 1200cc engine pumping out a useful 80 pound-feet of torque. Roland found the donor bike in a junkyard—wrecked but serviceable. 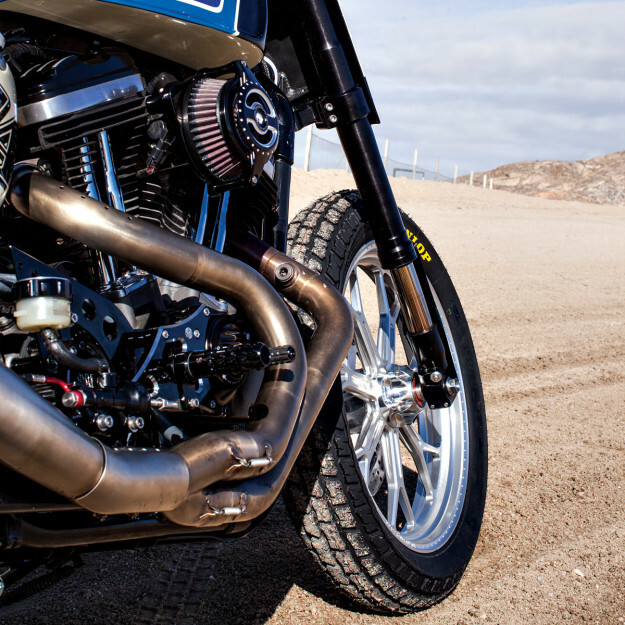 He’s boosted power with a Vance & Hines Fuelpak FI Tuner, and freed up the breathing with an RSD Radial Air Cleaner and a Slant 2-into-1 exhaust system. A heavy duty Barnett clutch gives a little leeway for abuse. Less conventional are the foot controls, a nod to the oval track ethos: rearsets on the left, and mid-controls on the right. The biggest upgrade is the suspension, with Suzuki GSX-R forks up front and Progressive Suspension 970 Series shocks out back. 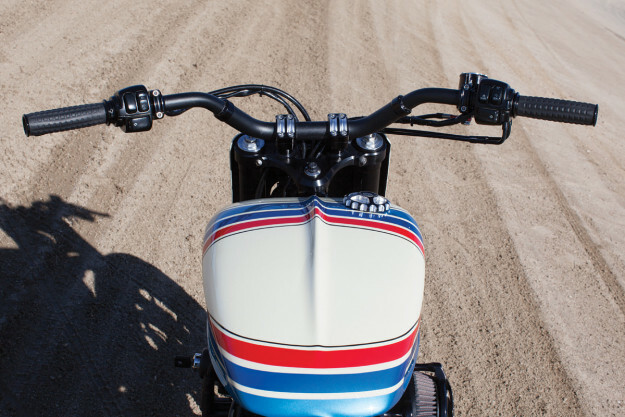 Custom-built triples have shifted the geometry closer to flat tracker standards for better handling response. The 19-inch wheels are Sands’ own drop-dead gorgeous Del Mar designs, in ‘Machine Ops’ finish. To boost braking power, the RSD crew have installed Performance Machine calipers and hooked them up to Spiegler lines. 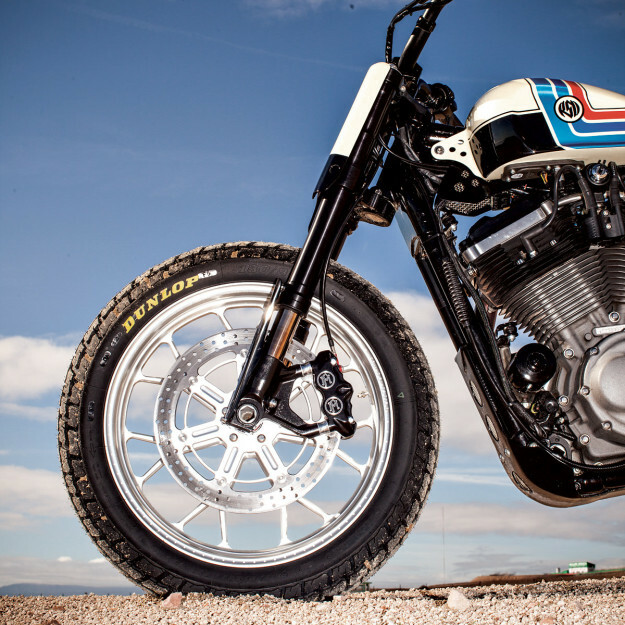 The rubber is Dunlop DT3, a classic flat track race compound. Sands is famed for his design eye, and Ameri-Tracker is beautifully balanced. 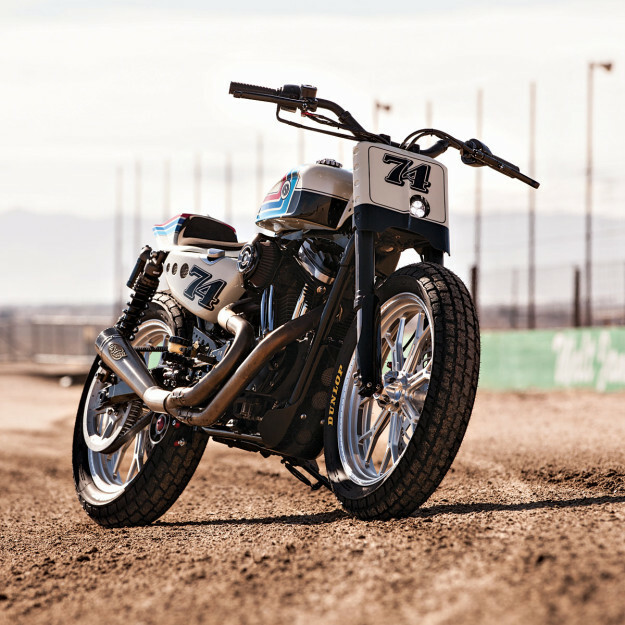 The tank is a modified version of RSD’s Softail Vintage Tank, but everything else is hand-made—from the side plates to the slimline seat and the kicked-up tail. It’s putting the ‘Sport’ back into Sportster. And the kind of Harley we’d like to ride.